The Times had a leading article last week that took up from its news article the day before. It stated that "David Baldwin, a government adviser on the use of antidepressants, has resigned after a vituperative social media campaign against him". The leading article does mention the Public Health England (PHE) review set up by the Parliamentary Under Secretary of State for Public Health and Primary Care to review the evidence for dependence on, and withdrawal from, prescribed medicines, but doesn't make clear that Baldwin has resigned from this review. He's still Chair of the Royal College of Psychiatrists' Psychopharmacology Committee. The Times says that scientists should not attack advocates of antidepressants because antidepressants are a "gain to human wellbeing". I'm not quite sure what it means by this, because there is an ongoing debate in the academic literature about the efficacy of antidepressants (see previous post). Instead The Times has already concluded that the "evidence base is impressive". The leading article also makes much of the difference between clinical depression and everyday moments of low mood and sadness, although this distinction is of course relative and not absolute. Medication has in fact always been used in the history of psychiatry but what happened in the 1950s was that tricyclic antidepressants were marketed as a specific treatment (eg. see previous post). These drugs were closely related to the chemical structure of chlorpromazine, the first marketed specific neuroleptic treatment for schizophrenia. Before then drugs tended to be used in non-specific ways. The Times does recognise the value of talking therapy as well as medication. Helping people understand their problems and deal with them psychosocially has actually always been the mainstay of psychiatric treatment. And, of course, a multitude of different psychological therapies have developed after psychoanalysis - The Times mentions principally cognitive behavioural therapy and interpersonal therapy. The Times quotes the statement made by David Baldwin (and Wendy Burn, President of the Royal College of Psychiatrists), which led to the complaint which I signed about antidepressant discontinuation problems being minimised (see eg. previous post). But it doesn't say that the complaint was signed by 30 people, not just psychiatrists and psychologists, but also people who have experienced antidepressant discontinuation problems. Instead it misleadingly says that 10 psychiatrists and a psychologist from the PHE panel complained. I'm one of the 10 psychiatrists that the leading article is referring to, but I'm not on the PHE panel! I also signed a subsequent letter, as I was concerned that Baldwin's conflicts of interests could compromise his work on the PHE review group. The letter suggested he should be replaced with someone who had no such conflicts of interest (see Mad in the UK post). I'm not sure whether PHE had any concern about his declaration of interests. Certainly the Royal College of Psychiatrists had no such concerns (see press release). However, there are problems with institutional corruption within the Royal College of Psychiatrists (see previous post). Our complaint was not a personal attack on Baldwin but to ensure that the issues within the PHE group are discussed in as unbiased a way as possible. I'm sorry if David Baldwin felt distressed by the concern expressed about his role on the issue of antidepressant discontinuation but he is in a responsible position in the College. What happened was that @Truthman30 became aware of Baldwin after the joint statement with Wendy Burns. He has produced a blog since 2007 on what he calls the Seroxat Scandal. This issue is much wider than just antidepressant discontinuation problems. This includes the role of paroxetine (original trade name Seroxat) in producing suicide and violence. Personally I'm more sceptical about these claims (see eg. my review of Peter Breggin's book) but @Truthman30 regards Seroxat as perhaps one of the most dangerous drugs ever made. He knows this from his personal experience and 10 years of research for his blog. So @Truthman30's research into David Baldwin led to posts on his blog, which he described as being about David Baldwin's "long, incestuous, and financially lucrative relationship with the Pharmaceutical industry". This is where the term "pharma-whore" mentioned by The Times was used and @Truthman30 sought to defend its use. The "worse than Hitler" label comes from a comment on the blog by kiwi (not actually anonymous as The Times news article said, although the google profile has not been completed). @Truthman30 is unhappy that Baldwin described Seroxat in 1998 (the year @Truthman30 was first prescribed it) as "one of the safest drugs ever made" because of course this is not his personal experience, nor has it been backed up by the results of his research for his blog. As The Times says, "Inflammatory and calumnious invective is unfortunately part of online discussion on many issues." I agree that scientific research should be based on evidence and I look forward to the report that will come out of the PHE review. 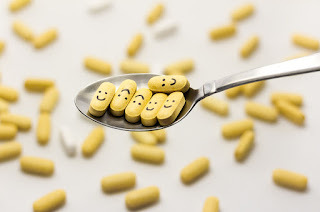 I would like to see more discussion in the academic literature about antidepressant efficacy and discontinuation problems (see previous post). I would also like to see more academic discussion about the issues of safety raised by @Truthman30 (even though I tend not to agree with all he says). It's important to stick to the issues. It's also a privilege to be able to discuss these issues publicly on social media and this privilege should not be compromised. I'm glad to be able to do so on my blog.